I can never win with the Big E parking lot. I get there early, I get shuttled off to the farthest reaches of the parking lot. Every other parking lot in every other Fair that I attend either ha a really good parking situation, or they offer shuttles. But for the Big E … it’s a game of getting there as early as humanely possible. As early as … I should have arrived last night. Anyway… I got to the Big E at around 9:00 a.m. And sure enough, the parking attendants point me to the farthest parking spot ever. I swear, it’s almost like they stuck me in Chicopee or something. And the last place I want to be is in Chicopee. It’s like Springfield with a stronger stench. But as I exited my car, I heard something. I turned around. A Big E volunteer, chauferring a golf cart. And three other people are on the golf cart, and there’s room for one more. I looked around to make sure that there wasn’ta senior citizen or someone who was otherwise physically challenged, they could have taken the seat and I would have walked. No one around. I climbed in. Hey, it’s at least better than hailing an Uber. After walking around the Big E’s Fairgrounds, and purchasing a couple of souvenirs, I decided it was time to visit the new England Center. And the first thing I wanted to find was my third burlap stitching project. 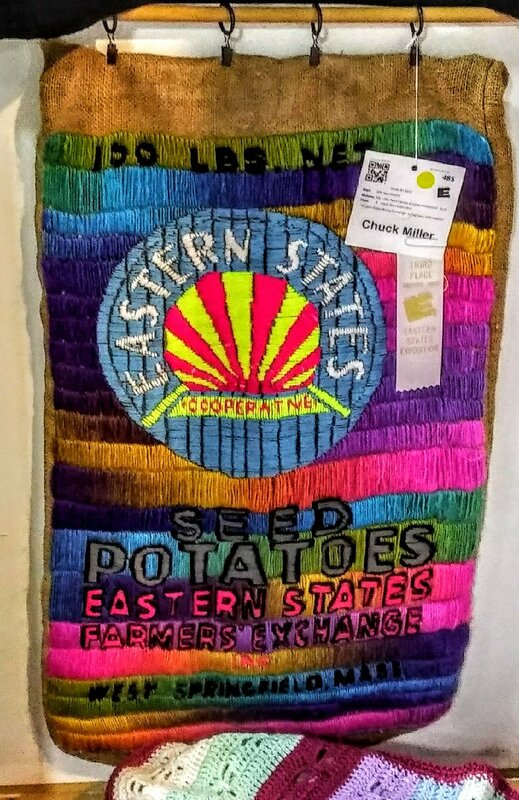 See, my creative project from last year, where I threaded colored yarn into a burlap fabric, has claimed ribbons in the other fairs – GLF Quality snagged an Honorable Mention in Syracuse, while Fort Orange Dairy & Feeds took a second place silk in Altamont. Aces. So how did my psychedelic ode to the farmer’s exchange of New England do? Oh look, there’s my artwork. So let it be said. All three of my stitch projects earned silks. I can now begin a new stitching project or three, without having to go back to more burlap. Works for me. But I entered two pictures in this year’s Fair – and the acceptance levels for photos are getting steeper and stricter every year. 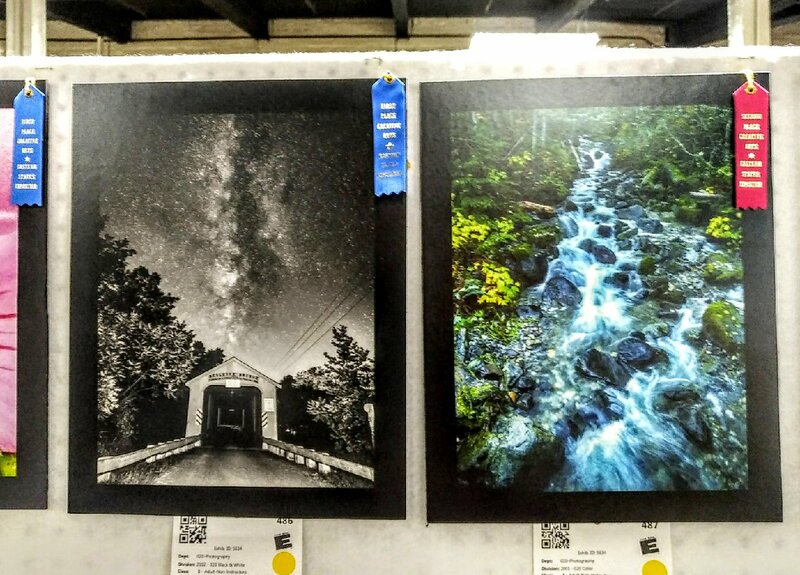 This year, entrants were allowed two photos … and the photos had to be pre-screened before they would even be considered for judging. There was a 75% acceptance rate, and thankfully my two entrants, Washington County 2:30 a.m. and The Mahari Stream both made the cut. Red ribbon for second place, second ribbon earned by this photo! Nice! The Mahari Stream has claimed a third place at Altamont and now a second place at the Big E! Two pretty ribbons! A second blue earned for Washington County 2:30 a.m.!! 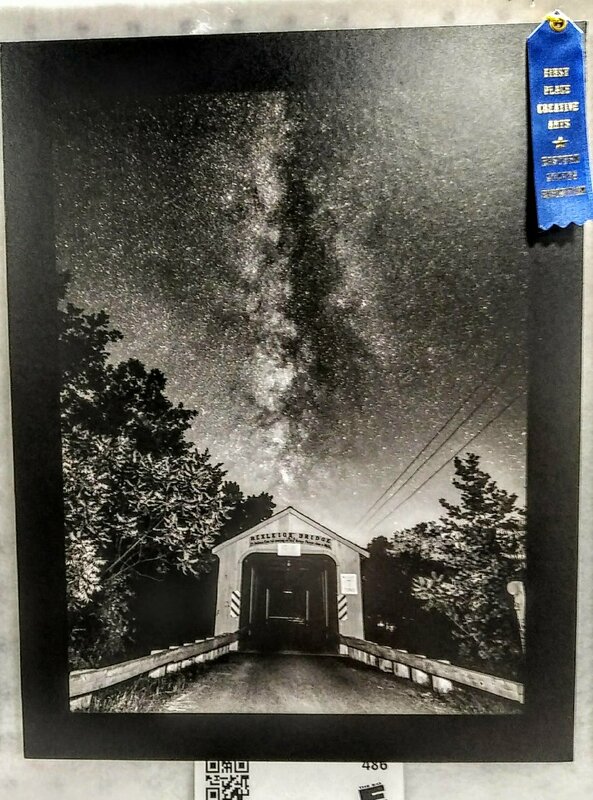 This picture picked up a second blue ribbon! Two blues for this shot! But if you want to know how clueless I was when it came to searching for this image in the New England Center …It was right next to The Mahari Stream on the wall, and I didn’t even notice it at first. I gotta get my eyes checked. So after a celebratory Big E eclair for lunch, and a few more moments pacing around the New England Center, I headed home. Successful run at the Big E, and I’ve picked up my fifth blue at this fair, which feels wonderful. But I’m not done yet.I still have both these pictures, plus one other, plus one burlap entrant, scheduled for delivery to the Durham Fair next week. But it still has a chance to wind down with a bang. Excellent, with a BIG E! What a beautiful collection on ribbons, you did yourself proud! Congrats; good for you and those nimble fingers! !👏🏻 A Happy and Healthy 5779 too! Congrats; good for you and those nimble fingers! !👏🏻 Best wishes for a Happy and Healthy 5779 too! Congratulations Chuck! Awesome jobs this season. More ribbons to admire. Congratulations! 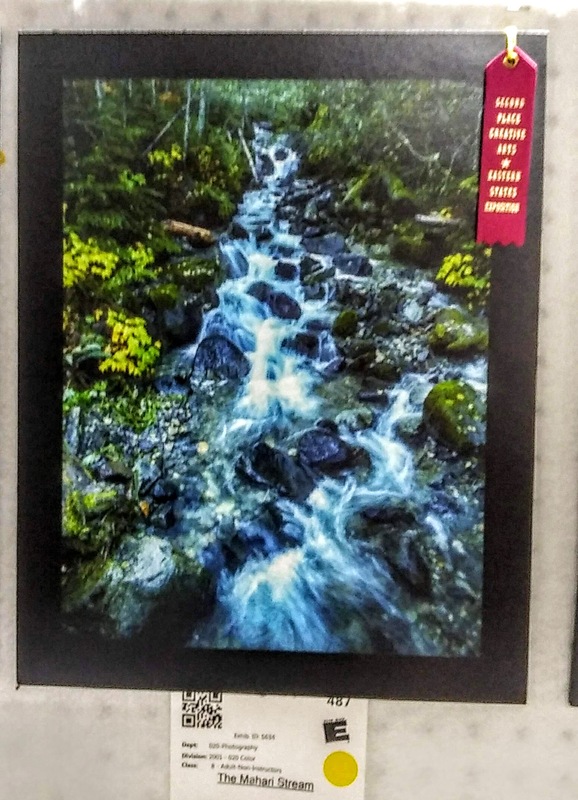 Since I cannot attend I saw my results online and my photos earned a second and third place ribbon. My Durham photos should have arrived Thursday so we shal see where that leads. Good luck in Durham. Did anyone go to the Apple-Wine fest at the Altamont Fairgrounds? They wanted $8.00 /person to get in and $8.00/person for wine tasting. Then they want you to buy stuff. To rich for my blood when there are so many free things going on.